Bluetooth-Worm:SymbOS/Cabir identifies a large family of Bluetooth-worms that runs on Symbian mobile phones that support the Series 60 platform. Please note that the Cabir worm can only reach mobile phones that support Bluetooth, and are in discoverable mode. Setting your phone into non-discoverable (hidden) Bluetooth mode will protect your phone from the Cabir worm. Once the phone is infected however it will try to infect other systems even if user tries to disable Bluetooth from system settings. The details below describe the Cabir.A variant. 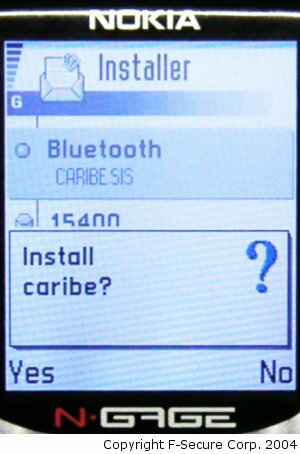 Cabir replicates over Bluetooth with a file named caribe.sis that contains the worm's main executable caribe.app, system recognizer flo.mdl and resource file caribe.rsc. The caribe.sis file will not arrive automatically to the target device, so the user needs to answer yes to the transfer question while the infected device is still in range. The question will be repeated to the user if they select no. The user must click the SIS file in order to install it. The SIS file contains autostart settings that will automatically execute caribe.app after the SIS file is installed. The worm then activates and starts looking for new devices to infect via Bluetooth. 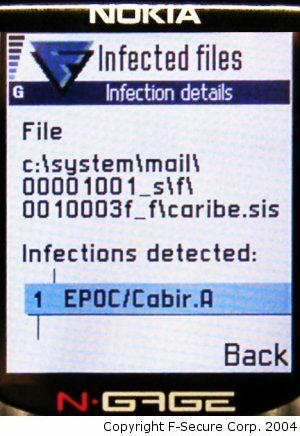 The Cabir worm starts sending infected caribe.sis files to the first device it finds. The replication routine in Cabir contains a bug that causes it to lock onto the first device found; it won't continue look for other devices. Cabir is capable of sending infected files to only one other device per activation. It will try to infect one other device when it is activated the first time, and then one more each time when the phone is rebooted. In our tests we also found that the newly infected phone will first look for the phone that sent it the infected file. This means Cabir is capable of spreading widely only in cases where the phone that sent the infected file is out of range before the user activates Cabir on the new phone. This means that while Cabir is capable of spreading in the wild, it would spread quite slowly and would not cause a large epidemic. One curious fact is that in Series 60 phones the bluetooth functionality is independent from the GSM side, and if the phone is rebooted Cabir will try to spread even if the user doesn't enter his PIN code. 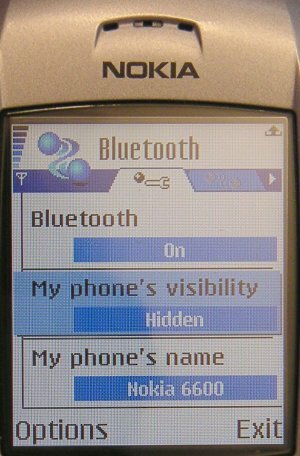 If the user selects "Yes" the Cabir worm will activate and show a dialog that contains the name that malware author wants to give to the worm and the author's initials and the group initial of 29A (it seems that in some phone models, for example Nokia 6600, this dialog is not shown). This is most likely done in case the user installs the application to the memory card. Then the worm will recreate the caribe.sis file from worm component files and data blocks that are in caribe.app. 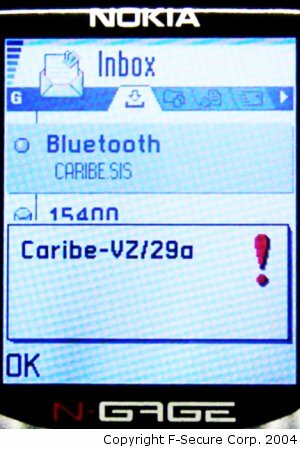 After recreating the caribe.sis file, the worm starts to look for all visible Bluetooth devices and send the SIS file to them.